We're moving right on through the year, like it or not! 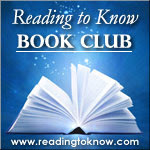 Our March read for the 2012 Reading to Know Bookclub is The Pilgrim's Progress , by John Bunyan. I think it's easy to lose sight of that fact when we get caught up in the day-to-day tedium of our lives. We aren't able to comprehend the big picture of our lives as we are too close--our emotions, distractions, and myopic vision mislead us. We are part of a great story--the ultimate story--that of good vs. evil. If we could only keep that perspective each day of our lives, I think our lives would look very different. We would perceive the fiery darts of the devil for what they are instead of obliviously focusing on this earthly life. I'm counting on this allegorical story to remind me to focus on the big picture so I can live a more God-glorifying life each day. 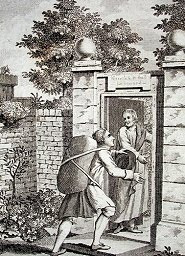 To read more of Shonya's initial thoughts on Pilgrim's Progress, you can see a post she wrote HERE on her blog. I hope you will join us in re-reading this amazing Christian classic. You have until Friday, March 30th to read this one! At that time I will publish the wrap-up post and invite you to share your thoughts! April's Selection: ANY title of your choosing by P.G. Wodehouse. I'm in! It is on my shelf...but must finish another book first. Snagged the free copy for my Kindle last night. Now to see if I can stand to read it on there. :-). I might have to scare up a paper copy of this one! I'm going to attempt it! I bought a used copy a couple of years ago but haven't made time to read it. When I was younger my mom and I read an amazing picture book version over and over. I think I should graduate to the "adult" version! I went to get this one from the library yesterday, and it's lost. They made me fill out a paper to order a new one, so I'm really hoping it comes in with enough time to read it! I'm really excited about finally reading some Wodehouse, too. I'm definitely planning on reading The Girl in Blue, because it's on my shelf, but I want to read a story about Jeeves, too. That said, my favorite character is Psmith and I avoid the golf stories because even while I believe that Wodehouse can make anything seem funny, I have a stronger belief that there is absolutely nothing funny at all about golf. Oh @Bluerose!! :( I REALLY hope you find a copy! Especially since you've never read it!!! Anything with Psmith is good. The Lord Emsworth books are good. I am reading one of those for my pick. Some of the stand-alone books are good too. The adventures of Sally, and Ukridge come to mind. I also disagree with Carrie on the golf stories. I am not a golfer, but find the stories hilarious. The Coming of Gowf imagines golf as a pagan religion in amusing fashion. My favorite line from the stories is, "After all, a woman is only a woman, but a hefty drive is a slosh." And there are many more. I'm looking forward to this one! I knew I had a copy somewhere and I found it the other day sifting through my massive piles of books.